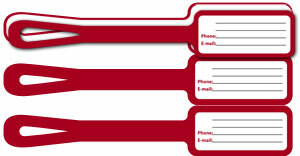 We offer a template for personalized luggage tags. With this template, you will get seven personalized luggage tags, with your custom design printed on it; you can also write on them. These luggage tags are shorter than our 10″ long 100744-3 tags. You can choose any one of our materials from the list below.